Before Chris Whitehead and the gang injected some much-needed life back into the Sonic series, there really wasn’t a lot out there for the hardened 2D Sonic fan. Sonic Team down at SEGA seemed more content with spending the last 20 years trying to jam a square peg into a round hole, hoping that they could eventually wear the concept down enough to fit. While the blue hedgehog’s shift into the third dimension has been far from seamless, it’s always nice to see there’s a generation out there who still remember the glory days of burning through Green Hill Zone. 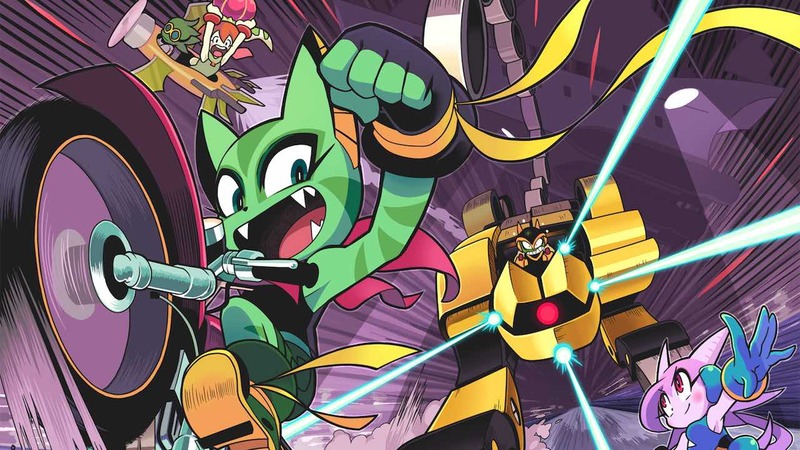 Freedom Planet is one of the games inspired by that very generation, a game that rides more inline with a fan fiction spin-off than it does a love letter to the series. Originally released on Wii U in 2015, Freedom Planet has you zipping through loop-the-loops at top speeds in a similar fashion to the SEGA mascot. The 16-bit polyphonic tones share an audio vibe to the Mega Drive classic, while the game’s visuals somewhat reflect the larger than life spritework of 32X Chaotix mixed with the animated character rotation gimmicks of Sonic 3. Despite the obvious similarities, there isn’t a hedgehog in sight amongst the springs and bridges. Instead, you start out your adventure with the choice between a cat on a scrambler and a pink dragon girl called Lilac. Carol the cat feels a little closer to home with fans in how you can curl up into a ball if you can gain enough momentum. Pressing the jump button while airborne will send Carol gliding like Knuckles until you can find a wall to latch on to. Her motorbike, collected as a unique power-up, changes her moveset slightly by allowing you to spin attack instead of glide with navigational skills that will put a Trials rider to shame. Lilac, on the other hand, is the speedier of the two on foot who possesses a horizontal slice attack during her second jump. Her meter-draining special ability lets you blast across the screen with a burst of energy – a handy tool to keep the pace going while sending enemies in her path into oblivion. There are actually three characters that you can choose from, although you cannot swap between any of them during the main playthrough. The third addition to the team is a fluttering hush puppy (who you meet a little later on in the story) with a tendency to launch objects and power-ups found throughout the levels. Each of the controllable characters looks as though they have been pulled straight from the 90’s non-canon Sonic Underground TV show – all looking pretty much like Sonic rather than the animals that they’re apparently representing. Their differences in playstyles, along with some of level design quirks do attempt to steer away from being too derivative of the source material that inspires it. Despite that fact, some choices made in an effort to change up the formula can give the impression that there’s a beat missing amongst the rhythm of the gameplay. Running through the huge levels are, for the most part, a joy to play through. There’s a fluid sense of control over your character, along with wonderful sprites and colours to feast your eyes upon. Where the problem lies is that the massive stages cater more for little collectable cards as opposed to the intriguing Chaos Emerald hunt that’s so heavily burned into the head of the Sonic aficionado. The collectable cards found around the worlds do unlock gallery features and supplies a light distraction of longevity, but it’s hard not to feel like there needs to be something more important to obtain in order to make the sheer scope of the stages feel a bit more relevant. Nevertheless, there’s still plenty of replay value to be had here. Each character’s approach to stages alone provides a reason for another blast through with certain sections tailored for each one of them. There’s also an achievement system to flesh out the challenge and a few bonus modes such as speed trials and target practice to beat high scores with. On top of that, you have the rather lengthy story that you can thankfully just ignore altogether by choosing the filler-killing Classic Mode. In regards to the story itself, there’s over an hour worth of voiced dialogue that comes across like an amateur YouTube video of grown adults role-playing with children’s toys. As for the plot, it is basically an uninspired tale of an evil bug who wants to rule the universe like Thanos and it’s up to our furry friends to stop him. Without going into too much detail, it’s pretty much like a feature-length episode of Care Bears with a few decapitations thrown in for good measure – which, admittedly, does sound much better than it actually is. The plough of the gameplay has its fair share of ups and downs. One moment, you can be free-running through levels that fall on par with the best of the Sonic series, while other times you will be faced with a boss fight that feels like more effort than it’s worth. Still, there is plenty of charm to be found in Freedom Planet, with a stack load of little tricks to separate itself from the fan project Sonic game it originally started out as. You can see that Stephen DiDuro and the gang down at GalaxyTrail have the utmost respect and love for the Sonic legacy. The fan’s eye of improvement with the underpinning stage mechanics set in place being a clear example. Now that the dust has settled from the successful trailblaze left by Sonic Mania, Freedom Planet gets to have another crack at filling the withdrawals left behind by the blue blur. In this regard, Freedom Planet does enough to serve that cause while presenting a decent amount of gameplay changes to stand on its own feet. It’s just more unfortunate that its core gameplay style is so inevitably comparable to the classic formula. A comparison that can ultimately hinder the flow that you may naturally expect from it. Either way, there’s still a decent enough fast-paced platformer to be found here, and one that fits snugly with the portable nature of the Nintendo Switch.